[Spiritual Franciscans record] the names of the condemned and the days or calends on which they suffered like martyrs. On this date in 1318, four Franciscans — Jean Barrani, Deodat Michel, Guillem Sainton, and Pons Rocha — were burned at the stake in Marseilles. This illustration of the martyred friars also adorns the cover of the book So Great a Light, So Great a Smoke: The Beguin Heretics of Languedoc … which tells the story of what happened next. These Fraticelli were part of the great and multi-headed 13th-14th century movement towards spiritual poverty — movements like the Apostolic Brethren, of Fra Dolcino fame. generated movements of men bent on a poorer life, in protest against the corrupt priests … [the Fraticelli] claimed that Christ and the apostles had owned no property, individually or in common; and the Pope condemned this idea as heretical. An amazing position, because there is no evident reason why a pope should consider perverse the notion that Christ was poor. Distinct from Dolcino et al (who were outside any official institutional order) but mutually sympathetic with their like, the Fraticelli were “Spiritual” Franciscans who rejected the more worldly accoutrement that even their humble order had taken on. In the hands of a more supple pope, this popular energy might have helped the Church, but John XXII — who held his court at Avignon in the care and feeding of the French crown — rejected his predecessors’ attempts at brokering compromises and just cracked down. And you have to enforce perfect blamelessness. It began in the Avignon papacy’s Provencal back yard: southern France, which had felt the papal whip before, had proven very fertile soil for the Fraticelli, with its own similar Beguin movements among the laity. Soon after Pope John ascended the seat of St. Peter, 25 obdurate Spiritual Franciscans were summoned to Avignon to answer to the Inquisition; 21 of them succumbed to the menacing proceedings and produced their “obedient” recantations, leaving the four stern enough to persevere unto the stake. Many more, too many to track from the era’s sketchy documentation, followed them in the ensuing years. The fires kindled at Marseilles were a signal for the extermination of the Spiritualists throughout Provence. We hear of burnings at Narbonne, Montpelier, Toulouse, Lunel, Lodvfere, Carcassonne, Cabestaing, Beziers, Montreal. Mosheim tells us of a band of a hundred and thirteen Spirituals sacrificed at Carcassonne from 1318 to 1350. 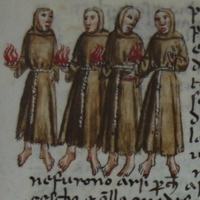 Wadding tells us that the Franciscan inquisitors alone burned one hundred and fourteen of the zealots in a single year (1323). And Angelo compares the indiscriminate frenzy of the persecutors to the fierceness of rabid dogs and wolves. The works of Olivi were condemned at the Pentecostal chapter of 1319 at Marseilles, and even the bones of many saints who had died uncondemned (though suspected), were cast out of their tombs. The result of the fierce persecutions was to stamp out the Spirituals in Provence. 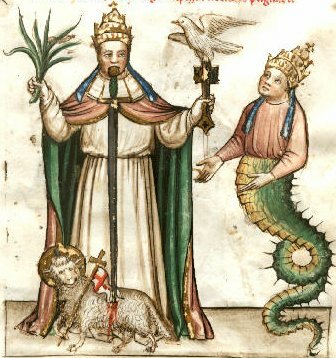 Image of Pope John XXII as the Antichrist. 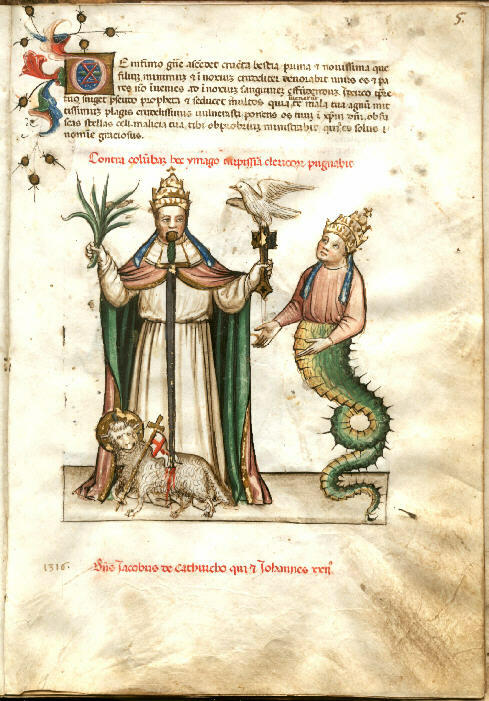 15th century image from the Vaticinia de Summis Pontificibus, adapted from a c. 1340 illustration of the apocalyptic pro-Spiritual text as described in The Use and Abuse of Eschatology in the Middle Ages. ** William of Ockham — the Occam’s Razor guy — had to flee to imperial protection because, although not a radical Fraticello, he merely considered well-founded the doctrine that Christ and company didn’t own anything. Why are modern Catholics perplexed by such Papal “infallible’ sentencing; the Fratecelli were”Socialists” or possibly ‘Communists’. In 1324 the RCC also sentenced Adam Dubh O’Toole, an Irish chieftain to a similar death at the stake — probably outside Trinity College, Dublin, which the church has inherited from Protestant Ireland! Why burn Adam Dubh O’Toole? Because he denied the Resurrection, the Immaculate Conception and the growing power of the RCC to plant a Roman Priest in every tribe, thereby replacing all Gaelic Chieftains, and retain power and tribute to the Roman Church to the present day. There are now hundreds of Parish Priests but not one Gaelic Chieftain. What’s new — in Korea, China, Yemen, India, amongst the tuttsi etc., etc., etc..?